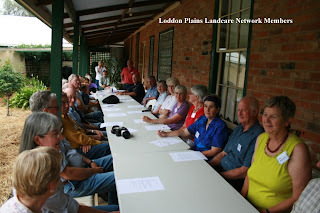 The latest meeting of the Loddon Plains Landcare Network was held at the property of Stephen and Sally Maxted on the Serpentine Creek, Durham Ox, 20th of November. 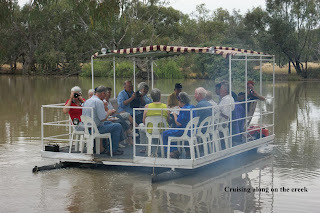 Thirty people braved the uncertain afternoon weather to attend an event which was designed to be a brief meeting followed by a get to know one another bbq and cruise on the Serpentine Creek. The assembled company consisted of representatives from various Landcare groups, Friends of Kooyoora and the Wedderburn Conservation Management Network (WCMN). Among the members present were such veteran Landcare identities as Andy Hay from Kamarooka Landcare and NUFG, Bill Twigg from East Loddon Landcare and Jill MacFarlane a founding member of the WCMN. Matching up to all of these prodigious champions of the environment was four year old Noah Condcliffe, a member of the Salisbury West Junior Landcare group. It was also encouraging to see Christine Brooke of Loddon Vale Landcare group, not in her Mayoral role but among all others registering, by their presence, a concern and commitment to changing our environment for the better. Draft Mission statement – was accepted in general form with proviso for adjustment if necessary. Landcare Assets – a few people indicated that they knew something of where such things as rotary hoes etc were located as used by the previous Landcare regime – this will be followed up. Design of the LPLN Logo – this will be thrown open to competition, including schools. Substitute for Jean McClymont for the Norman Wettenhall Foundation deputation visit on the 24th Nov. – Colleen Condcliffe agreed to fill in. Setting up a blogspot/website for the network was mentioned briefly- the secretary will be looking for any and all articles, environmental snippets, general network gossip, information on junior landcare etc that members can contribute. The possible use of funds to initiate a planting of trees by volunteers recruited from Bendigo and/or Melbourne and billeted by network member groups was discussed. The suggestion found favour with members and it was further suggested that such a planting could be organized to coincide with the Friends of Kooyoora Wildflower Show which is to be spread out over two weeks next year. The meeting declared closed, all assembled fell to enjoying the rest of the evening which consisted of a fine bbq meal presented in beautiful surroundings, much interesting conversation and a scenic cruise on the creek. Views on the creek were impressive, all with their own charm as light passed from dusk to dark. Many thanks to organizers of the evening especially Mal Brown and Laurie, Jo, Stephen and Sally Maxted. Article by Michael Moore, photographs: upper – Phil Dyson, lower – Mal Brown.